The Reef Hotel Casino gears up for The Great Aussie Weekend, celebrating Australia Day, with The Great Aussie Songbook and The Great Aussie Giveaway – celebrate Aussie style! Forget the heat – forget the outdoors, stay cool and get indoors this Australia Day long weekend and celebrate in style with the crew at The Reef Hotel Casino. 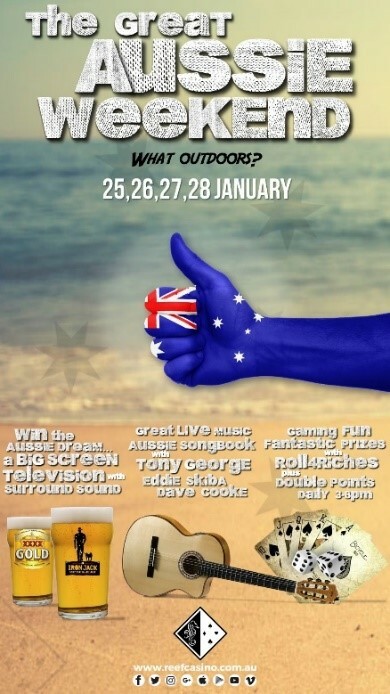 Gearing up for their Great Aussie Weekend promotion, there is a host of fun to be had across the entire long weekend, kicking off from Friday 25th and carrying through until the Public Holiday Monday (28th). 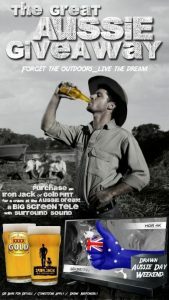 With great giveaways – such as winning a big screen television – there are heaps of fantastic prizes across the four days. 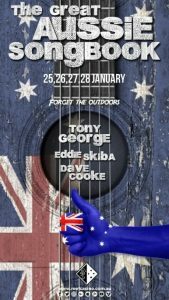 Embracing the Casino’s great love of Australian music, BAR36 will be showcasing the best music from Down Under with The Great Aussie Songbook performed by Tony George, Eddie Skiba and Dave Cooke. Audiences can expect all their favourite Aussie anthems performed across the weekend throughout the Casino complex. Celebrate Australia Day with the ultimate Australian countdown – musically! An enigmatic entertainer, Tony George has been entertaining audiences in the North for more than two decades. A former Melburnian, Tony is proud to call Far North Queensland his home and is a regular on the gig guide list at BAR36 and The Reef Hotel Casino. His wide repertoire connects with audiences and his shows are always a crowd pleaser. Singer-songwriter Eddie Skiba is no stranger to performing at BAR36 and The Reef Hotel Casino. 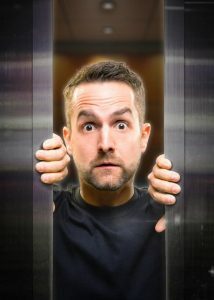 Well-known for his fresh brand of indie rock, he has toured the breadth of the East Coast, and received acclaim for his international shows in Ireland and Austria. He’s supported the likes of Hoodoo Gurus, Diesel, Dragon and Chocolate Starfish and has two albums under his belt. Dave Cooke is considered one of the North’s hardest working musos, notching up more than 150 shows a year – mixing corporate, weddings, festivals and ticketed shows. He effortlessly blends lap slide guitar, didgeridoo, stomp box, acoustic guitar and his powerful vocals to create a unique earthy sound that sets him apart. He traverses folk, roots, blues and pop with his multi-instrumental style and tackles all the classics. The Great Aussie Songbook runs nightly from 8pm on Friday 25th, Australia Day Saturday 26th, Sunday 27th and the Public Holiday Monday 28th January 2019. Music kicks off on Friday and Saturday night from 7.30pm with Eddie Skiba, followed by Tony George til late. The early Sunday Session starts at 5.30pm with Eddie Skiba, and Tony George performing until late. The Monday public holiday will see Dave Cooke bringing the live music to BAR36 from 6pm. *** Live at the Casino shows in BAR36 are non-ticketed shows.